Walk Without Pain offers a wide range of types of orthotics. We are not owned by an orthotic laboratory and are free to prescribe comfortable orthotics suitable for a wide variety of conditions and budgets. The aim of orthotic treatment is to reduce pain and discomfort. This is largely achieved by reducing abnormal stresses placed on the tissues of the feet, legs and lower back. Orthotics can also function to improve gait and over all balance in the body. Our University trained podiatrists have extensive biomechanical knowledge and experience from many years of practice in the Brisbane region. Custom made orthotics are, as the name suggests, individually created to meet your needs. 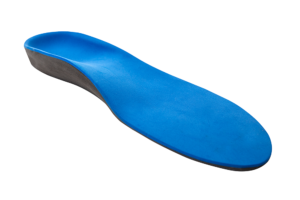 In these types of orthotics, we seek to balance support, correction and comfort. Each foot is either casted or scanned with a 3D scanning camera. Each orthotic of the pair is designed individually. Custom types of orthotics can be made of a wide range of materials to best suit the comfort and needs of your lifestyle. This is particularly important when considering what types of footwear you want to be able to use your devices in. To transition from business shoes, casual footwear and joggers can require some extra finesse in the design. Hard Orthotic materials. Our most commonly used material for orthotic plates is a polypropylene shell, made using computer guided routing from a thick sheet of the material. Traditional plastic sheets that are heated and formed to make orthotic shells are of the same thickness across the whole device. Routing from a block allows the orthotic shell to be varying thicknesses in different parts of the device. Strong where they need to be, flexible and forgiving in crucial areas. Soft types of orthotics: We also use EVA or soft orthotics where required. There are definite advantages and disadvantages with these devices. These decisions can be made in concert with your podiatrist. We can show you samples of different types of orthotics, discuss the pros and cons and understand your needs before creating your prescription. These types of orthotics are cheaper than fully custom made devices. Whilst they are altered and fitted to meet your needs, they are not specifically made for your foot. We keep a range of these prefabricated devices in the clinics, and so they can often be made ready very quickly. One downside is that they are chunkier than custom devices. This means that they will fit into less shoes than slimmer orthotics. Additionally, because they are made to suit a range of people, they are often less flexible as they are made to withstand heavier body weights. Medical insurers do not pay a rebate for off the shelf inserts. If you have medical insurance, it will often be more expensive to pay out of pocket for a cheaper device – even at the chemist – than to have an orthotic custom made to suit your needs. Copythotics fulfil a niche for those needing sleeker types of orthotics. A thin membrane is moulded to capture the ‘prescription’ of your previous successful orthotic. Modifications can be made to the hardness or softness of the material and the size and shape of the device. We can then use a range of densities of materials to fit the broadest possible range of shoes. These orthotics tend to be lightweight and flexible due the large range of materials we can select from. A common time we will use a Copythotic is when seeing a patient who has had orthotics made elsewhere that were not quite right. 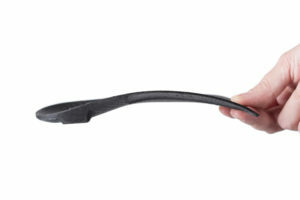 For example, an orthotic that was too hard and inflexible can be modelled and remade from more pliable materials. These are very comfortable orthotics. They are also around half the price of having a brand new custom orthotic designed for your foot. These shoe inserts were very common the the 1970’s and 1980’s. While they are not seen as much any more, they are still an excellent solution for some problems such as taking pressure off corns. Milder conditions of heel pain can also respond well to their use. We make these insoles on site, with orthotic making equipment in each of our clinics. For more information on the best types of orthotics to suit your particular problem, make an appointment to see one of our podiatrists for a consultation.